There were close friends, family and good music; but something was missing, the appetizers… They were the same old, boring finger-foods. We needed a new snack to get the party started! That’s why we created Party-tizer Dippin’ Chips™. Now you can bring the deli to your party by complementing your favorite fresh deli dips with Dippin’ Chips™. Our chips are made with the finest ingredients and designed to give you the perfect amount of dip with no mess. You know what that means… no more double-dipping! We even love them on their own! Explore your inner foodie by creating unique dip and chip pairings that fit your personality and taste. Make your hors d’oeuvres the talk of every party with Dippin’ Chips™. Life’s a party – dip it up, snack it down! Party-tizers Veggie Dippin’ Chips™ are uniquely designed dippable tortilla chips made with certified gluten-free ingredients. Our recipe starts with US home grown corn and a blend of delicious veggies, carrots, spinach & kale. We challenge you to try them with or without a dip. We love them both ways!!! 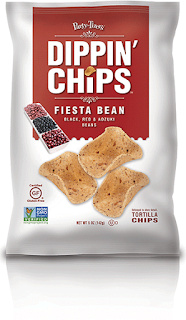 Party-tizers Three Bean Dippin’ Chips™ are uniquely designed dippable tortilla chips made with certified gluten-free ingredients. Our recipe starts with US home grown corn and a blend of delicious beans, black beans, red beans & adzuki beans. We challenge you to try them with or without a dip. We love them both ways!!! 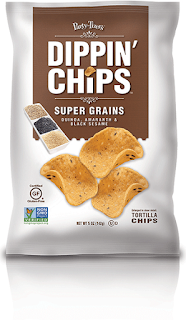 Party-tizers Super Grains Dippin’ Chips™ are uniquely designed dippable tortilla chips made with certified gluten-free ingredients. Our recipe starts with US home grown corn and a blend of delicious grains, quinoa, araranth & black sesame seeds. We challenge you to try them with or without a dip. We love them both ways!!! 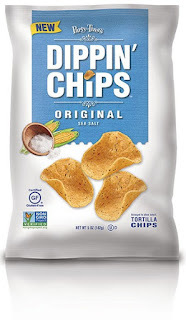 Party’tizers Super Grains Dippin’ Chips™ are uniquely designed dippable tortilla chips made with certified gluten-free ingredients. Our recipe uses US home grown corn. We challenge you to try them with or without a dip. We love them both ways!!! Party’tizers Super Grains Dippin’ Chips™ are uniquely designed dippable tortilla chips made with certified gluten-free ingredients. Our recipe uses US home grown organic blue corn. We challenge you to try them with or without a dip. We love them both ways!!! Party-Tizers Dippin' Chips are amazingly delicious! I love that they are built for dipping and infused with good flavor and that they are deliciously unique. 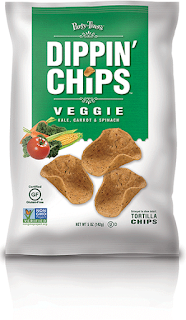 I enjoyed every variety of these chips but my favorite were the Veggie Dippin' Chips. The flavor is incredible plus just knowing they contain carrots, spinach and kale makes me feel better about eating them. 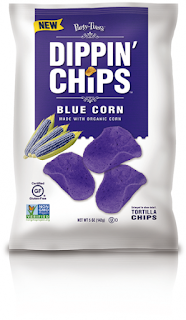 My kids enjoyed the Blue Corn Dippin' Chips because of the rich blue color and their wonderful flavor. They are beautiful and make for a wonderful presentation for any party or get together. Each of these varieties of Dippin' Chips are great for snacking on alone or paired with a great dip. Click HERE to locate a store near you that sells Party-Tizers Dippin' Chips! Click HERE to learn more about Party-Tizers Dippin' Chips! Follow Party-Tizers Dippin' Chips on social media!